The forecast for Sydney had some promise for the day - "fine and sunny with a possible late thunderstorm". Early satellite imagery and analysis charts identified a complex low over Victoria with a trough over coastal SE NSW and another dipping down from Queensland. 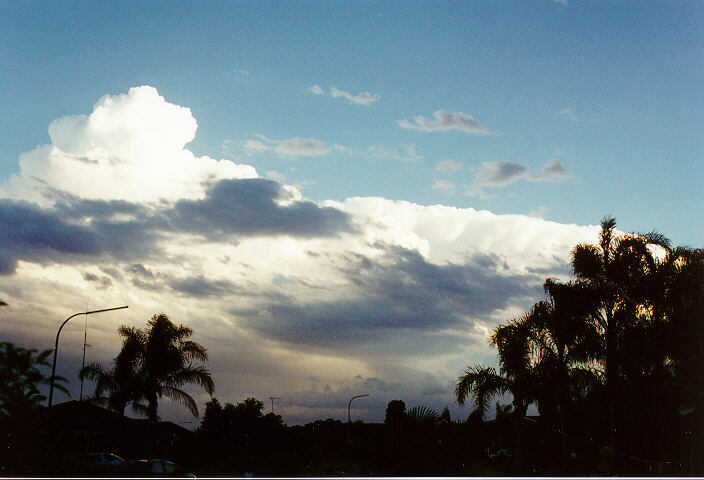 Scattered small cumulus mainly over eastern suburbs was a feature of the morning sky. By noon it was not looking all that good: the sky was clear, and satellite imagery showed storms off the coast rather than developing to the south-west, although it still looked like a slight chance for the evening. 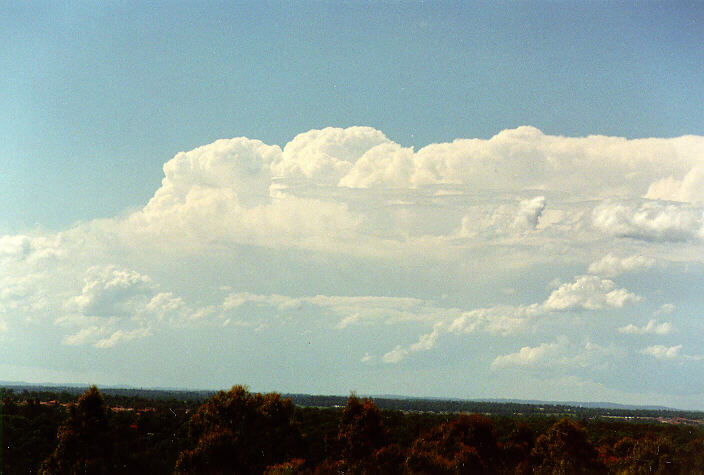 However, by 1pm large cumulus had formed to the west, north and south. A very weak cell showing multicellular characteristics developed in the far western suburbs and slowly propagated in an east north-easterly direction. I heard two or three claps of thunder between 1.30 and 2pm and ventured over to Rooty Hill for a much better view. The depth of the cell was probably only 4 or 5 km, but gave some shower activity to the southwest a few kilometres away. Although only small it exhibited a nice structure and an anvil. This cell dissipated to the east by 3pm. While on the Hill I observed a single larger storm to the distance north, many enormous cells well off the coast, and some new activity developing to the south. The west and southwest did not look all that promising with just small and moderate sized cumulus occurring there. 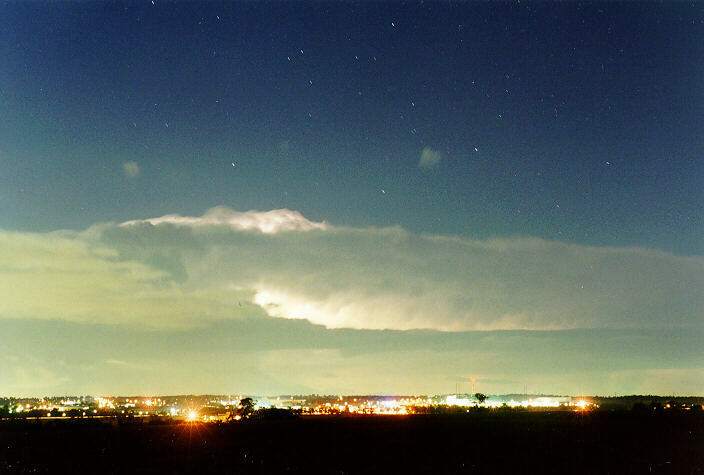 Left: Early weak cell to the west, and right: larger storm to the distant north. By 5pm, satellite imagery showed many storm cells off the coast and a notable one near Wollongong - probably the severe storm that Michael Thompson encountered a rotating wall cloud and funnel. Encouragingly a few small 'blobs' were showing up in the Illawarra Tablelands to our southwest. A large storm to the south became illuminated by the setting sun soon after 6pm (which certainly caught my attention !). 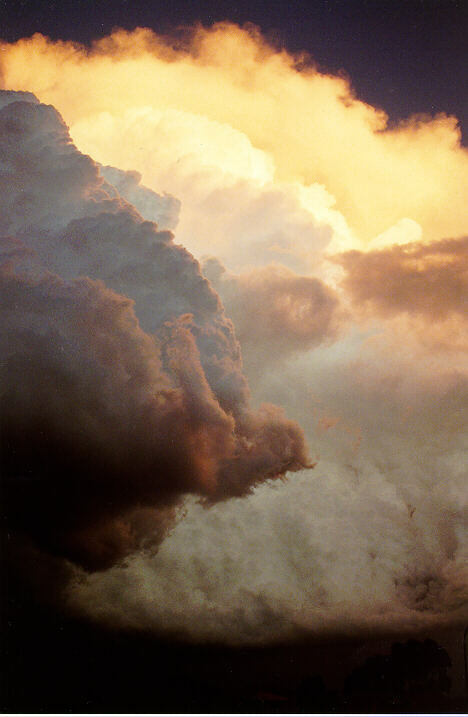 More importantly, to the west and south-west, storm clouds were gathering. I head thunder to the west at 6.30pm and taking a better look realised a large storm complex was developing. I raced over to Rooty Hill again to capture the scene. 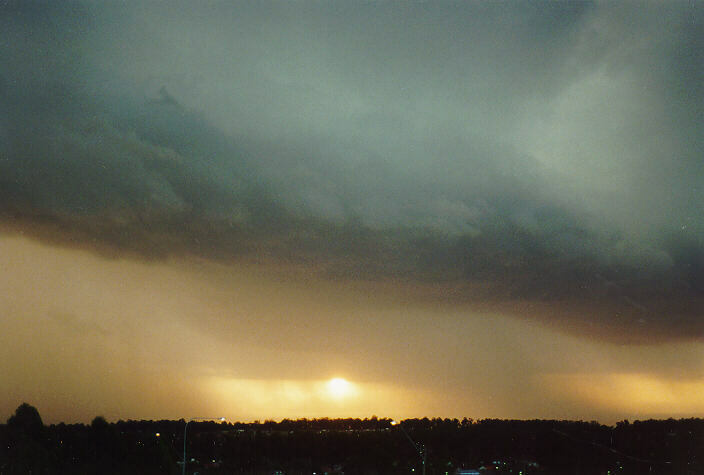 A lowered base and shelf cloud extended from the south-west to west, brilliantly illuminated from the setting sun below. 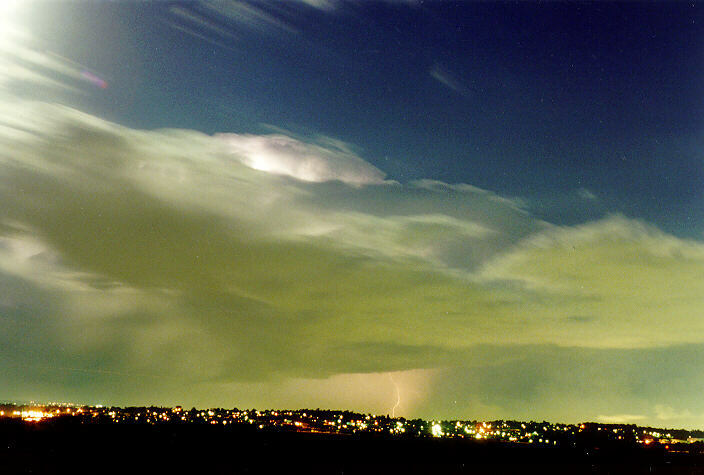 Cloud to ground lightning was already too close for comfort and intense precipitation cascades were quickly advancing. A few minutes of video footage and some photos and I was off - still filming the storm as I drove!! 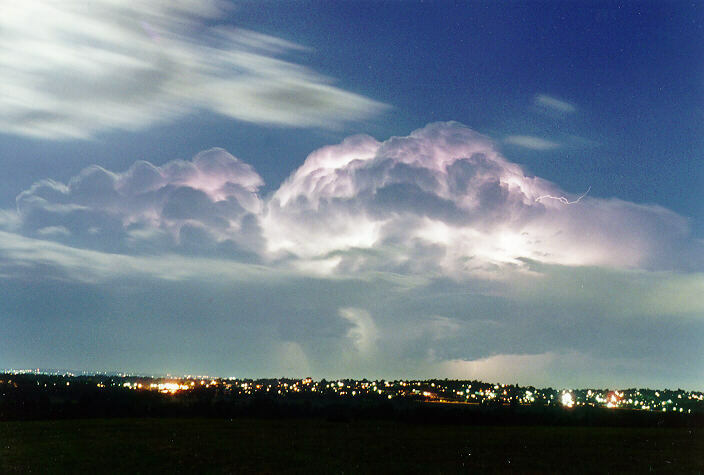 (Rooty Hill is the highest point around my area and is a grassed hill - no trees, no buildings - so it is not the best place to be when lightning is close, although it is the place to be to observe weather). Large drops fell on the trip home, but I avoided the mean looking area by a kilometre or so. 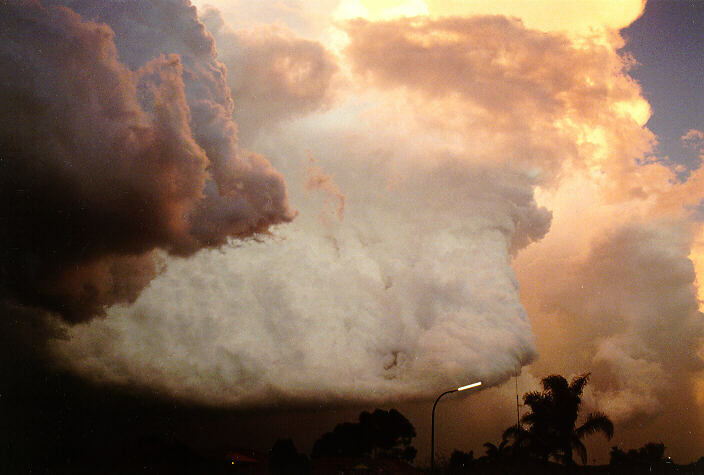 Left: the storm that caught my attention - this was the one that produced the wall cloud and funnel near Wollongong, 60km to the south. 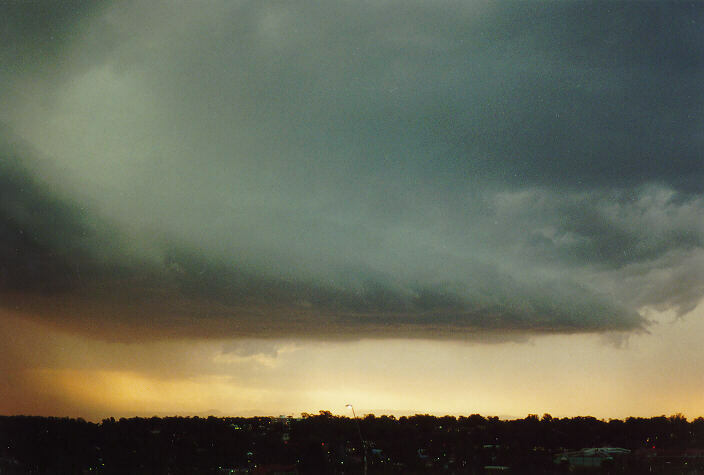 Middle and right: approaching shelf cloud - lightning was very close. At home, the storm passed to the south while another cell developed overhead and another to the north-east. Many cloud to ground lightning strokes occurred nearby with one in particular only about 50 metres away - needless to say an incredible boom occurred virtually simultaneously with the flash. A shower of light rain from the north-west followed at 7pm, then clear skies to our west made for an awesome scene. 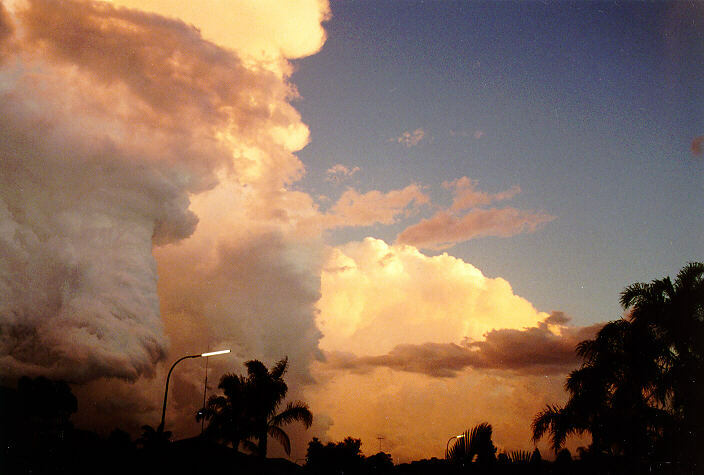 Three vertical columns of cumulonimbus with lowered bases coloured yellow, orange, white and grey became visible to the east and south-east. The turbulence in this and the surrounding clouds was most impressive. Branched lightning shot out the back of the cloud into clear air nearby. An incredible scene !! Awesome scene as the sunset illuminated the storms edging away to the east. 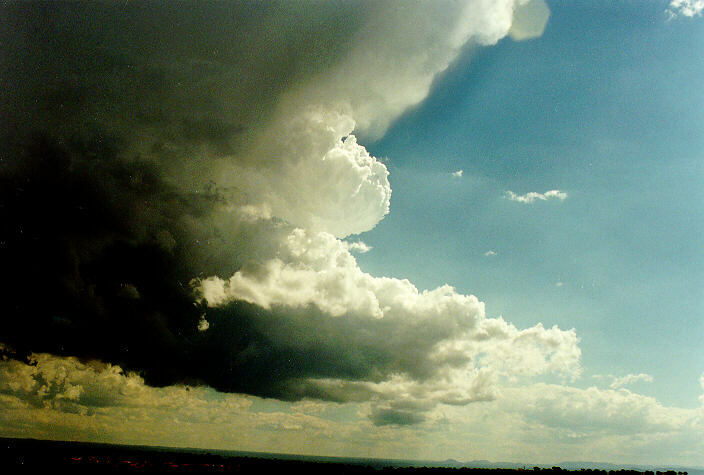 Click here for another 25 shots of this cloud formation by Annette. The colour slowly dissipated by 7.15pm as the sun set. As darkness fell the lightning show became more apparent - constant flashes mostly within the storm clouds. When it was totally dark I paid a third visit to the Hill for some lightning photography. About a roll of film was used in about 15 minutes from 8.15pm. 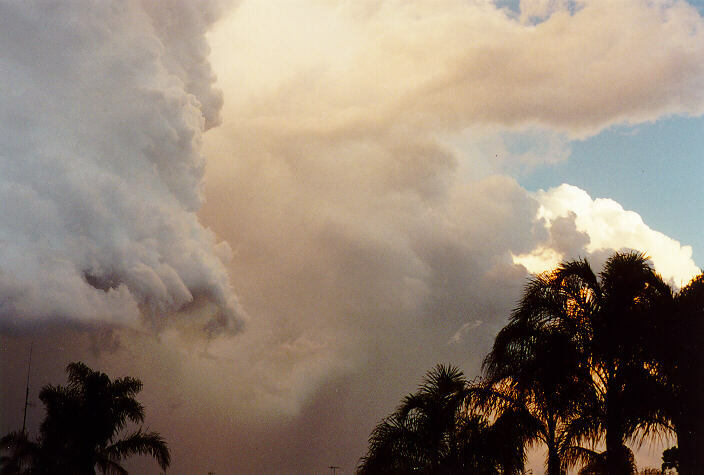 The cells did not lose any intensity until well into late evening, in fact the activity intensified after I left Rooty Hill. 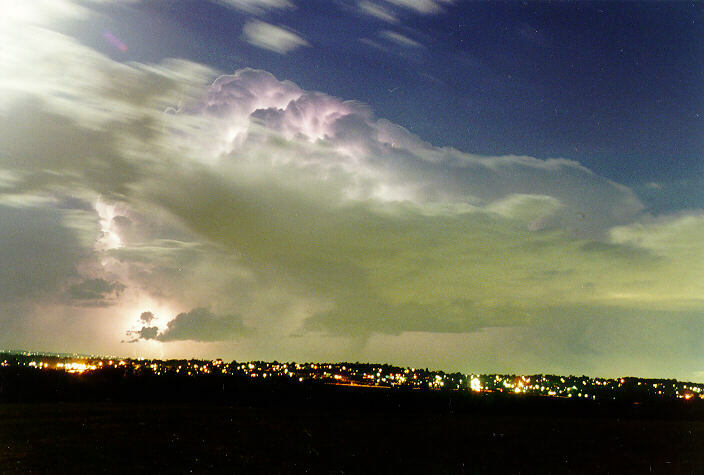 Several storms in a line stretching many tens of kilometres gave constant lightning for many hours. 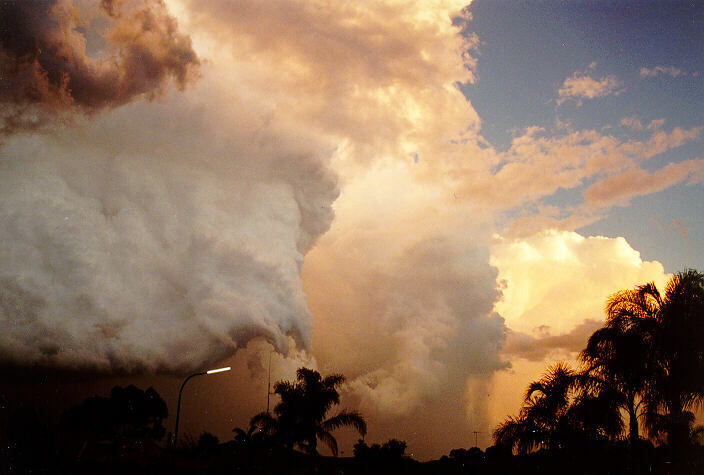 Synoptically, a low pressure centre and front formed off the coast, south-east of Sydney during the night. Fresh south to south-westerly winds cleared all activity well out to see by Monday morning.